US: Underwriters Laboratories (UL) has completed fire performance evaluation on some of USG’s Sheetrock Brand EcoSmart Panel products. The testing concluded that 15.9mm USG Sheetrock Brand EcoSmart Panels Firecode X (UL Type ULIX) and USG Sheetrock Brand EcoSmart Panels Mold Tough Firecode X (UL Type ULIX) is specified in more than 260 fire-rated wall, column, and floor- and roof-ceiling UL designs in which Type X or Type C panels are required. “Quickly and accurately identifying gypsum panel types in the field – especially after the panels have been hung and the joints are finished – can be challenging. Consequently, fire performance may be compromised if Type X panels are inadvertently hung as the ceiling membrane, whether in steel or wood construction, when Type C panels are required,” said Nestor Sanchez, senior manager, building science at USG. US: Ultimate Software says that National Gypsum is using its UltiPro product to manage its human resources system. The gypsum wallboard producer is using the product to address challenges in manufacturing and cost control and manage its skilled workforce. National Gypsum started working with Ultimate Software in 2004 and it launched UltiPro's talent management solutions in 2015. 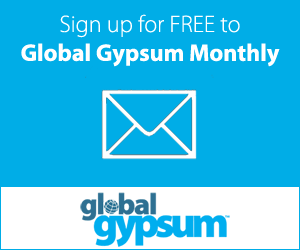 "I can say without exaggeration we are creating ad-hoc reports daily that look at data such as labour allocation, succession planning and global demographics," said Bruce Williams, director of human resources at National Gypsum. He added that the real-time reports aid the company to adapt to industry conditions, extend key resources and make cost savings. The software product has also enabled National Gypsum to reduce the size of its human resources team. Spain: Isolana has gained an Environmental Product Declaration (EPD) for its Isoplac laminated gypsum wallboard product. The EPD was registered in late January 2018, it will last five years and it was verified by Tecnalia R&I Certifcación. Isoplac A13 and A15 are laminated gypsum boards with double-sided cardboard and gypsum core, manufactured by continuous rolling process. Isoplac gypsum boards are installed in partitions, backings and interior ceilings forming systems that provide the acoustic insulation, thermal resistance and fire resistance required in each case. Finland: Construction materials manufacturer Saint-Gobain has transferred some of the manufacturing of Gyproc Habito wallboard from the UK to Kirkkonummi in Finland. Deliveries from Kirkkonummi started at the beginning of 2017. Habito products are exported from Kirkkonummi to the Baltic and the Nordic countries. The company has invested Euro1m in Gyproc Habito production at its Kirkkonummi site in 2017. Investments have been made in the laboratory, product development, personnel training and the production line. Virpi Riekkinen, Business Director at Saint-Gobain Finland, expects further investments to be made in 2018. Gyproc Habito accounts for roughly 10% of the production of the Kirkkonummi factory. The company expects to recruit around five new employees for the Kirkkonummi site in 2018. US: Sensortech Systems is looking for client companies to run extended trials of its new Kiln Jam Detector KJD-7000. Part of the trial will be to test the functionality of the sensor and, over a period of some months, check reliability and stability. Another part is to receive input from users as to what features need to be incorporated, particularly in the software design. The company says that its new radio frequency (RF) gypsum wallboard jam detector product offers a saving compared to previous sensors. The RF sensor requires no maintenance and is unaffected by siloxane build-up or other debris. The Kiln Jam Detector KJD-7000 uses a custom-designed coaxial cable able to withstand the high operating temperatures. The sensor itself follows the design of open-frame planar sensors used for moisture measurement. The outer frame is formed from 16ga stainless steel; ceramic insulators isolate a stainless-steel centre electrode to which the high temperature cable is attached. The electronics unit is located outside the dryer at each deck level. An on-board 32-bit ARM-Based micro-controller processes signals from up to three sensors and networks via RS-485 to a dedicated programmable logic controller (PLC). The system software is set to trigger an alarm when either no product is detected over the sensor for a pre-defined time interval, a blockage upstream, or if a failure to detect gaps between boards over a pre-defined time is recognised. All sensors in an array are node addressable on an RS-485 network. If an anomaly occurs at any sensor, the exact position will be known including which deck and its position on the deck (left, right, centre). Sensortech will be displaying its new kiln sensor at the Global Gypsum Conference & Exhibition taking place in Krakow, Poland on 25 – 26 October 2017. Germany: Claudius Peters’ has launched an upgrade to its Rotary Drum Cooler (RDC) that is intended to low energy costs and includes new features. The product operates on the counter-current indirect principle re-using cooling air as preheated combustion air for the hot gas generator, with a reduction in plant energy costs. During the cooling process, the RDC enables homogenisation of materials, with reduction of unwanted calcining by-products such as soluble anhydrites and dehydrates. The cooler can handle up to 100t/hr of product. “We are proud to have been supplying the gypsum industry with cutting-edge products for more than 20 years. Our Rotary Drum Cooler deploys state-of-the-art technology to maximise plant efficiency by reducing maintenance and energy costs,” said Claudius Peters’ managing director Reiner Fruehling. Other features of the RDC include trunnion bearings, central axis feeding and discharge, aeroslide feeding and discharge, variable speed motor for soft start-up, improved automatic lubrication system and optional inlet housing for external cooling air. US: National Gypsum has published 17 health product declarations (HPD) for a range of products that cover nearly all of its interior wall systems. "At National Gypsum, we recognize that sustainable building design isn't just a trend but has become the preferred business practice for top architects and developers in the country," said John Mixson, vice president of sales and marketing. The HPDs cover all product brands and 40 products. They include: Gold Bond Brand; Fire-Shield Type X; Fire-Shield Type C; XP Fire-Shield Type X; XP Fire-Shield Type C; High Strength Fire-Shield LITE; High Strength Fire-Shield LITE 30; SoundBreak XP Fire-Shield; eXP Interior Extreme; eXP Tile Backer; eXP Sheathing; eXP Shaftliner; DEXcell Brand Glass Mat Roof Board; DEXcell Brand Cement Board; and PermaBase Brand Cement Board. US: USG has released Sheetrock Brand EcoSmart Panels, a lightweight gypsum wallboard panel with sustainable credentials. The panel is based on USG's UltraLight Panels and USG's Corporate Innovation Centre developed new gypsum core chemistries and a manufacturing process to reduce 20% of carbon dioxide emissions and decrease water usage by 25%. It is being released in the US in two core formulations for fire and non-fire-rated applications. The product was developed in response to the Architecture 2030 Challenge for Products in July 2016. It may also contribute to achieving additional US Green Building Council (Leadership in Energy and Environmental Design) LEED v4.0 credits and meet the requirements of the Living Building Challenge. "There has been a significant movement in the architecture community to reduce the carbon footprint of the building sector," said Edward Mazria, chief executive officer and founder of the Architecture 2030 Challenge. "Yet, to fully achieve our goal for the building sector to become carbon-neutral by 2050, manufacturers like USG must quickly rise to the occasion and develop sustainable, low-carbon and zero-carbon building materials."